and looking younger and packed with energy, day after day. The powerful cocktail of active ingredients in LIFT EFFECT® has the power to prevent and visibly reduce all the signs of ageing (slack skin, wrinkles, dryness and loss of elasticity) that affect every skin type to some extent after the age of 30. Its natural exfoliating and re-densifying action eliminates dead cells, leaving your skin smoother and your complexion totally uniform. 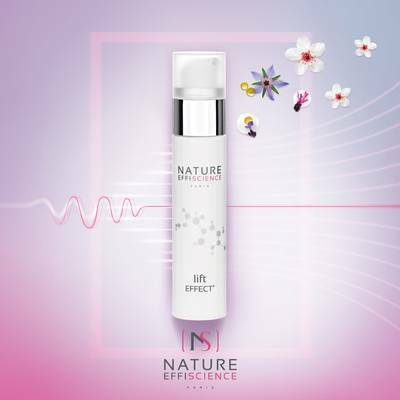 The synergy effect reconstructs and reinforces the skin’s protective barrier and its elasticity, instantly relaxing wrinkles with long term anti-ageing effect. Our complex containing Butterfly Lavenderstimulates the multiplication of Keratinocytes skin cells and redensifies the epidermis. The Aloe Vera and Shea butter provide moisture,Stoechiol reduces its lossby improving the structure of the epidermis. The association of extracts of White Tea and Red Ginseng makes this the best care product for combating fatigue and wrinkles. Use LIFT EFFECT in synergy with the BOOSTER EFFECT serum to thoroughly cleanse and prepare your skin for the care product and to combine their complementary active ingredients. Apply every morning and/or evening to clean, dry skin on the face, neck and neckline area, using gentle, light touches.